Sure there is a ton of free music on the web, but what if you want some music you can use as part of a presentation that you are sharing? You either need to compose and perform your own music or come up with some royalty-free music. A Google search for such music will return quite a few sites, but most of them have an up-front fee. Want to create your own music even though you are not a musician? 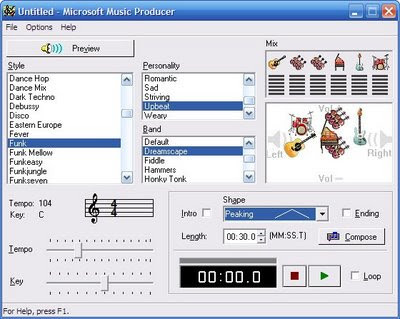 Try MS Music Producer (downloadable from the link, but follow directions). This is an old Microsoft orphaned program I played around with back in the 90s, but it's not bad. You pick your own style, personality, instruments (and you can move the instruments for separation and prominence), set tempo and key, pick the 'shape,' indicate if you want an intro/ending or if it should be looping, and set the length of the piece. Hit compose, and it creates a song on the spot. Don't like it? Just hit compose again or change instruments or personality. You save your creations as MIDI files. It won't be confused with professional music, but here's a 30-second example I made. If you just want some background music, it'll do. For more info, check this fuller listing of resources I have. Now, how did I get off on this subject? I was looking for some music by Vector (long disbanded but still worth listening) which featured the guitarist Jimmy Abegg. What I stumbled upon was some music by Marty and Bob Abegg. For biblical studies sorts, does one of those names ring a bell? Yes, this is the same Martin G. Abegg who is one of the authors ofthe Dead Sea Scrolls Bible and of The Dead Sea Scrolls - A New Translation. See, biblical studies can be cool after all! I saw your post regarding free audio for presentations and thought I would add a few more sites with free royalty free music and sound effects. Thanks for the links. I'll add them to my other page when I get a chance.